Freshness Taste, & Aroma: The pretzels are made from scratch, hand rolled then twisted and baked right in front of the customer. The taste is unlike anything you have ever tasted before. The aroma permeates the store. Few can resist the attraction. Simplicity: The menu is simple. Pretzels, with different flavors and toppings, give the customer a variety of choices, but don't require the store owner to learn many different products. Pretzel making is easy, and no previous food experience is necessary. Costs: Many food businesses require expensive and perishable food ingredients. Pretzels consist primarily of flour, sugar, water, and yeast. Start up costs are low when compared to other food franchises. Our high-speed, hearth-bake conveyor ovens simplify an already simple process. This reduces labor costs and assures the consistency of the product. Pretzel Twister store owners also have the added benefit of being able to offer fruit drinks, juices, and Coke products. Automated Conveyorized Ovens: Our pretzels are specially hearth-baked directly on the surface of the oven just like the original pretzel bakers. The conveyorized oven assures perfectly baked pretzels every time guaranteeing consistent quality, reduced food waste, and eliminating the need for extra employees just to tend the oven. Outstanding Design: The Pretzel Twister stores have been designed by the Architecture Group of <?xml:namespace prefix = st1 ns = "urn:schemas-microsoft-com:office:smarttags" />Baton Rouge, La. Layouts are designed for efficiency and beauty and are versatile enough for almost any location. Comprehensive Franchise Support: From assistance in site selection, equipment leasing, store construction, marketing, and training, The Pretzel Twister team is there to help you every step of the way. 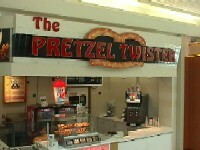 Opening a Pretzel Twister store is easy and relatively inexpensive. Costs to open vary depending on the size and location of the store. Franchise costs are summarized in the table below. Site Selection and store design assistance. Complete turnkey packages are available. Complete operations manual and training program including training in class, as well as on-site training in daily operations, equipment, maintenance and more. Simplified and proven concepts and use of our exclusive recipes and trademarks. Access to ongoing research and development in the areas of new products, equipment and packaging. We will work with food service distributors to negotiate the best possible prices. Continuous savings are passed directly to the franchise owners. Ongoing advertising, promotional and publicity material. Periodic visits to your area by our management to consult with you on aspects of your business. Complete dedication of our staff to assist franchisees in realizing their goals. Continuous updates of the operations manual. To learn more about the Pretzel Twister franchise opportunity, simply complete the form below.